Obesity and type 2 diabetes mellitus (DM2) are risk factors for cardiovascular disease. Weight loss improves myocardial left ventricular systolic and diastolic function and glycemic control. In healthy subjects myocardial triglyceride (TG) pools have proven to be flexible, associated with changes in myocardial function. Whether improvements in myocardial function are associated with changes in myocardial triglyceride (TG) content in DM2 is unknown. To determine the effects of substantial weight loss in obese DM2 patients on myocardial TG content and myocardial function. Body mass index (BMI) and plasma HbA1c were determined in 9 obese, insulin treated DM2 patients (mean age ± SE: 48.2 ± 3.2 yrs) before and after 16 weeks of a very low calorie diet (VLCD, 473 kcal/day). Furthermore, myocardial TG content and left ventricular (LV) function were determined using proton magnetic resonance spectroscopy and MRI respectively at 1.5 T (Gyroscan ACS/NT15, Philips). During the intervention all insulin and other anti diabetic treatment were stopped. The percentage (%) of myocardial TG was calculated as TG/water × 100. Myocardial function was calculated as cardiac output (CO) and ejection fraction (EF). In addition LV mass, blood pressure and diastolic ratio between the early and atrial filling phase (E/A ratio) were determined. BMI decreased from 35.8 ± 1.5 at baseline to 27.6 ± 5.0 kg/m2 (P < 0.001) after substantial weight loss (mean decrease: -25.6 ± 1.5 kg), and was associated with a significant improvement in HbA1c (from 7.8 ± 0.6 to 6.1 ± 0.4%, P < 0.05). Myocardial %TG at baseline was 0.74 ± 0.10% and decreased to 0.42 ± 0.32% after substantial weight loss (P < 0.05, Fig. 1A). CO decreased from 7790 ± 577 to 6552 ± 402 ml at baseline and after substantial weight loss respectively (P < 0.05). LV mass decreased from 119 ± 9 g at baseline to 101 ± 7 g after weight loss (P < 0.01, Fig. 1B). Ejection fraction was unchanged after substantial weight loss. Systolic and diastolic blood pressures decreased significantly from 144 ± 10 and 81 ± 3 mmHg at baseline respectively, to 120 ± 7 and 71 ± 3 after substantial weight loss (P < 0.01). Diastolic E/A ratio increased from 1.07 ± 0.07 at baseline to 1.24 ± 0.05 after weight loss (P < 0.05). 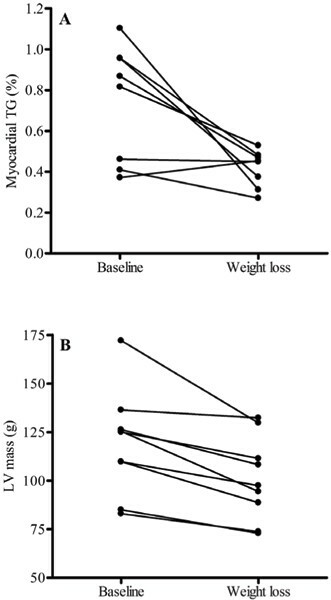 Myocardial triglyceride (TG) content and left ventricular (LV) mass are decreased after weight loss. * P < 0.05. Substantial weight loss in severely obese type 2 diabetic patients is associated with a decrease in myocardial triglyceride content and with improvements in myocardial function. Substantial weight loss in insulin dependent, severely obese DM2 patients improves glycaemic control and myocardial function. These improvements are associated with a decrease in myocardial TG content. We show for the first time that increased myocardial TG content in obese DM2 patients can be restored by weight reduction. Furthermore, myocardial TG content can be used as a biomarker to evaluate the response of interventions in DM2.